As previously discussed on this very blog, the issue of e-lending has come up in the European courts recently, specifically relating to whether it is allowed under EU law. While one would think the question is quite straight-forward, especially when specific restrictions have been put in place to prevent any abuse, the matter isn't necessarily answered in one word. Advocate General Szpunar handed down his opinion during the Summer, with many awaiting the ultimate decision of the CJEU; however, the wait is now over, and the Court has handed down its judgment on the future of e-lending a couple of weeks ago. By way of a brief exposition for those who have not read the previous article above, the case of Vereniging Openbare Bibliotheken v Stichting Leenrecht dealt with the lending of electronic copies of books by libraries in the Netherlands, and the remuneration of collection societies in the country for those activities (given for the lending of physical books). Per government policy, e-lending did not fall under the legislation entitling the authors to be remunerated for the lending of their works, but this was disputed by Stichting Leenrecht, ultimately ending up in the CJEU. The Court dealt with each question posed by Stichting Leenrecht in turn. The first question posed, as summarized by the Court, asked "...whether Article 1(1), Article 2(1)(b) and Article 6(1) of Directive 2006/115 [Lending Right Directive] must be interpreted as meaning that the concept of ‘lending’, within the meaning of those provisions, covers the lending of a digital copy of a book". The Court looked at whether the legislation would cover both electronic copies of books, and the concept of 'lending' could apply to the same. They concluded that, after considering all the applicable authorities, that "...intangible objects and non-fixed copies, such as digital copies, must be excluded from the rental right, governed by Directive 2006/115, so as not to be in breach of the agreed statement annexed to the WIPO Treaty, neither that treaty nor that agreed statement preclude the concept of ‘lending’, within the meaning of that directive, from being interpreted, where appropriate, as also including certain lending carried out digitally". The Lending Right Directive expressly applied to physical books, and thus excluded electronic copies of the same; however, the concept of lending under Article 2(1)(a) of the Directive applied to a more abstract, open interpretation of rights (rather than a right, potentially restricting it to only one form), allowing for the inclusion of digital copies as well as their physical counterparts. This applies to considerations that the Directive should adapt to "...new economic developments such as new forms of exploitation", and clearly the exclusion of any future forms of media would be short-sighted and undesired, and would limit the protection offered to authors through copyright. The Court also considered the derogation from the rights afforded in the Directive by Member States, and concluded that it could potentially apply in order to protect the public interests underlying the lending of books through libraries. 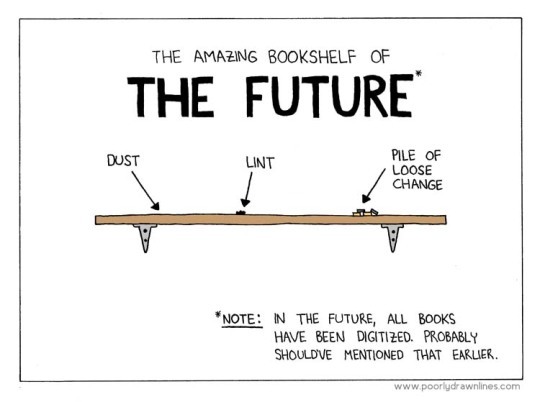 Also the library of the future? The Court summarized their findings in relation to question one as "...[the texts of the Articles above] must be interpreted as meaning that the concept of ‘lending’, within the meaning of those provisions, covers the lending of a digital copy of a book, where that lending is carried out by placing that copy on the server of a public library and allowing a user to reproduce that copy by downloading it onto his own computer, bearing in mind that only one copy may be downloaded during the lending period and that, after that period has expired, the downloaded copy can no longer be used by that user". The restrictions set a clear dividing line between lending and selling and/or distribution of the content, since this makes it very much akin to that of lending a physical book. They then moved onto the second question dealt with the possibility of derogating under Article 6(1) of the Directive, and subjecting it to the condition that the digital copy of a book made available by the public library must have been put into circulation by a first sale or other transfer of ownership of that copy in the European Union by the holder of the right of distribution to the public or with his consent. Quickly dealing with the second question, the Court saw that Article 6 did not preclude Member States from making the application of the provision subject to the above condition, since the condition would reduce the risks of prejudicing the authors of those works. This was followed by the third question, which asked whether Article 6 precludes "...the public lending exception laid down [in Article 6(1)] from applying to the making available by a public library of a digital copy of a book in the case where that copy was obtained from an unlawful source". Even though the Article is quiet on the legitimacy of the sources of those works, the Court dismissed the possibility, as this would "...amount to tolerating, or even encouraging, the circulation of counterfeit or pirated works and would therefore clearly run counter to [the] objective". This makes perfect sense, since the allowance of the use of illegal copies would be tantamount to legalising copyright infringement, at least in cases such as this. Article 6 therefore was seen to preclude the above possibility. The Court deemed the fourth question to not require an answer. The case is a very positive step towards accepting and embracing technological change, whether it is in the context of libraries or the use of digital content as a whole. The decision also leaves quite a bit of wiggle room for Member States to implement the Lending Right Directive, which allows for a more nuanced control of copyright protected works in e-lending.